On 3 July 2018, the FFG-ASAP project Sen2Cube.at held its kick-off meeting in conjunction with the AGIT/GI_Forum conference in Salzburg. 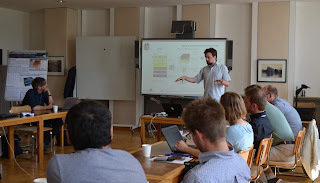 Aside from the academic partner (University of Salzburg, Z_GIS), the project involves AMA (Agrarmarkt Austria), ZAMG (Zentralanstalt für Meteorologie und Geodynamik) and the university spin-off SpatialServices. developing a Web interface for human-like queries based on spatio-temporal relationships and explicitly specifying spatio-temporal models for different envisaged user groups. The data & information cube is generic, meaning it can be useful for multiple thematic domains. The potential will be demonstrated by developing different services in a generic, proof-of-concept environment for Austria. These services include enabling semantic content-based image retrieval, generating cloud-free mosaics for user-specified time slices and developing an App for location-based queries through time.